Crawfish Etouffee (pron: Ay-too-fay) is sometimes mistaken for Crawfish Stew. The difference between Cajun cooking and Creole cooking is Cajun food is more "country" cooking and Creole food is more refined "city" or French cooking. The Cajuns used roux's and heavy seasoning whereas, the Creoles used delicate, rich creams and their food was lighter in color and taste. 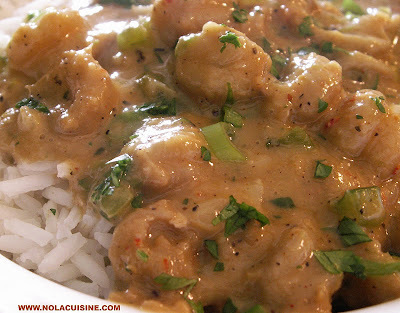 This is a fine example of Creole Crawfish Etouffee. Compare the ingredients and photographs to my Crawfish Stew recipe. Melt butter in large heavy-duty pot. Add onions, peppers, garlic and all seasonings. Saute, stirring occasionally until onions are translucent. Add flour and mix thoroughly for 1 minute, stirring often. Add whipping cream and half-and-half. Cook until cream thickens but does not boil, stirring often. Add crawfish tails. Stirring often, cook until meat and vegetables are done. Crawfish may be substituted for shrimp. Saute' onions, green onions, and garlic in butter in a pot until onions are browned and wilted. Stir in cream of celery and cream of mushroom. Increase heat and bring to a boil stirring constantly. Reduce heat to medium and stir in crawfish and Tony's seasoning. Cook for about 10 minutes and reduce heat to medium. Sprinkle parsley on top. Serve over hot rice.